Saturday night in Middlesbrough. Thoughts of coconut and chilli. It had to be Thai. There weren't that many options, surprisingly, although there is a great choice of restaurants in the Boro. The power of Twitter (thanks to Andrew Fisher, Love Middlesbrough, Kazoova, and Colleen Grogan) led me all the way to Stokesley, about 10 miles outside Middlesbrough, to Y'Thai. In my head I'm chanting 'Why aye, Y'Thai' all the way there, but this, I am reliably informed, is Geordie or Mackem speak, so apologies to all my Northern friends for my cultural confusion. 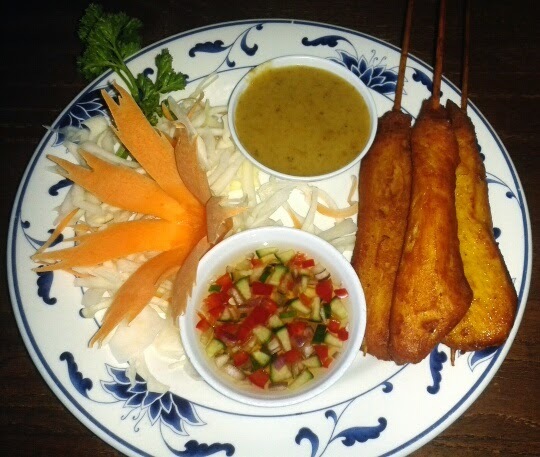 For me, Thai food is all about the starters. I could eat them all night! 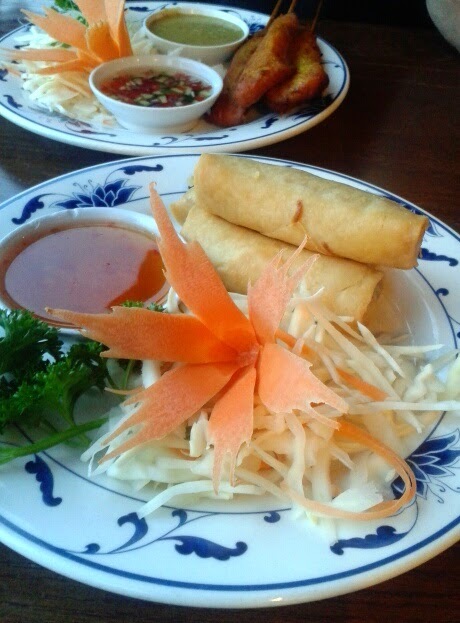 We chose the Satay Kai (Chicken Satay) with Peanut and Cucumber dip, the Kung Hom Pha (Crispy Wrapped King Prawns) with Sweet Chilli Sauce and (for comparison purposes only, honest) Poh Pia Pak (Vegetarian Spring Rolls). All delicious. Served with a pretty lotus leaf-shaped carrot garnish. Nice touch. 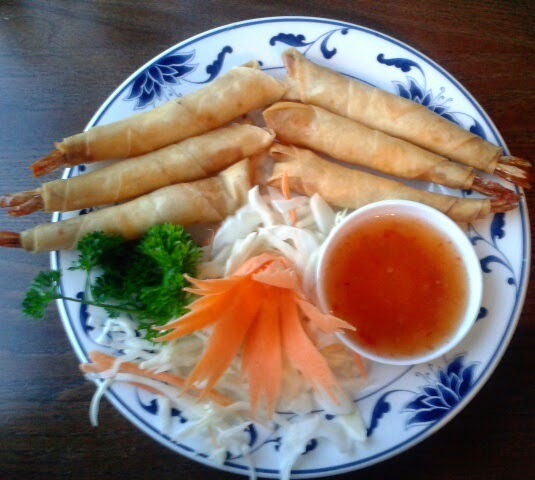 There's a great selection of starters, all reasonably priced (comparing them to Down London prices), all typical authentic Thai dishes. With some reluctance, we moved on to main courses. I only say this as I love the starters so much. It didn't take long before my Gang Mussaman (Chicken curry with potatoes) - a fragrant, heavy, coconut-based curry - transported me back to Koh Samui. Only two chillies on the menu, so I asked for an extra one, and it didn't disappoint. 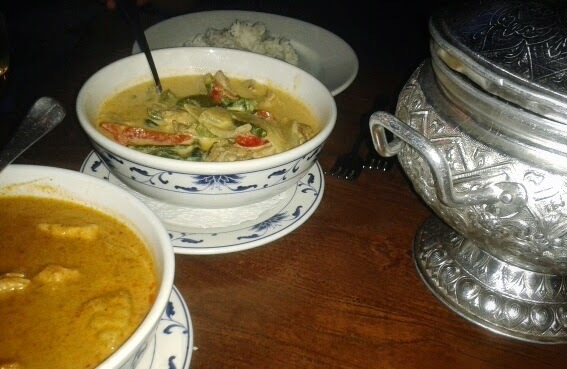 Himself had the Panang Nua (Beef Red Curry) - a lighter coconut-based dish - which was probably not the best we've had (well, we have been to Bangkok!) but pretty good all the same. It wasn't as spicy as I would have expected, but the flavours and spices were all there. 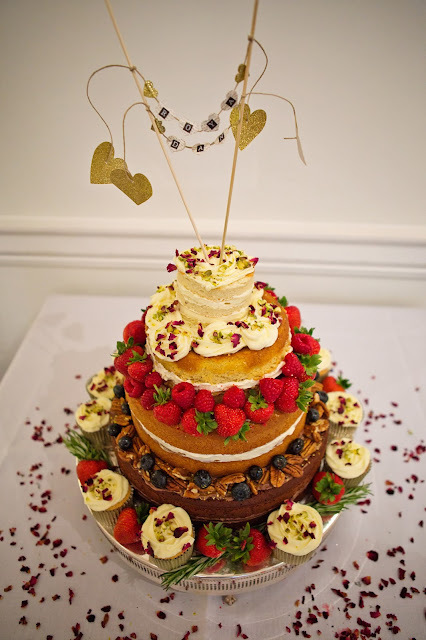 The service was excellent, attentive without being over-bearing, and the atmosphere was humming. Some traditional Thai décor set off the evening nicely, and the choice of beers, Chang, Tiger, and Singha, were also reminiscent of our travels. For a tasty Thai, I would definitely recommend Y'Thai. A shout out too to Boro Cars for getting us back safely. The app is awesome!